A new report claims that Google's smart thermostat and smart home hardware vendor Nest is considering a move to support HomeKit —but few hard details are available and new information suggests that compatibility isn't coming any time soon. In an account published by 9to5Mac, Nest was asked it if would examine iOS 11's expansion of HomeKit as it relates to the company's hardware. A representative from Nest reportedly reposnded, and said that it was "open to supporting HomeKit," but stopped short of sharing any product details. Given the vagueness of the remark, AppleInsider has attempted to confirm the statement. We were told by a Nest employee not authorized to speak on behalf of the company that there were "no immediate plans" and "no roadmap" for such a migration. The line of questioning regarding the possibility of Nest coming to HomeKit was inspired by a session during Apple's Worldwide Developer's Conference on June 7. During the session, Apple declared that an updated HomeKit specification will meanwhile allow authentication through software, instead of a dedicated chip. The software authentication in theory allows for a HomeKit upgrade on some older accessories through a firmware update. Potential SoC processor demands and other communication protocol issues surrounding HomeKit and Apple's required encryption may limit practical upgrades, however. 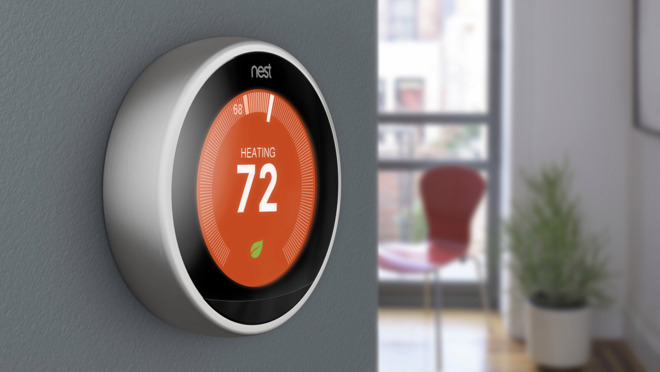 In 2011, Tony Fadell's first generation Nest Learning Thermostat shipped. On May 30, 2012, the Nest appeared at the Apple online and retail stores started stocking it. The core of Nest's employees and intellectual property was used to ultimately launch Google Home, with similar functionality to HomeKit. Three years after the Nest's launch, at Apple's 2014 Worldwide Developers Conference, Apple made its plans for its own home automation system public. Dubbed HomeKit, the system allows users to connect to a variety of compatible so-called "internet of things" devices through the iOS Home app in conjunction with each other, as opposed to a series of disconnected interfaces. On July 22, 2015, Apple removed the Nest from its online store for the second time. It was replaced by the HomeKit-compatible ecobee3 thermostat. At the time, Nest representatives said that their products would return to the Apple store, saying that "Apple is a valued partner to Nest and our new products will be available through Apple and other retail channels in the coming weeks." The device has been gone from Apple's shelves for nearly two years. From a hardware perspective, Alphabet's Weave "Internet of Things" protocol, and Apple's HomeKit are incompatible. The lack of network interoperability would necessitate some re-engineering in software, and possibly hardware, by Alphabet's Nest Labs prior to any shift.